The spine for my son's homeschool is the Classical Conversations' Foundations program. 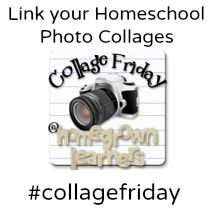 I have heard criticism that CC can RESTRICT a homeschool, but I have found that it actually gives me a guide and a jumping off point for further learning. It frees ME up to spend my time on other things that are important to our family. 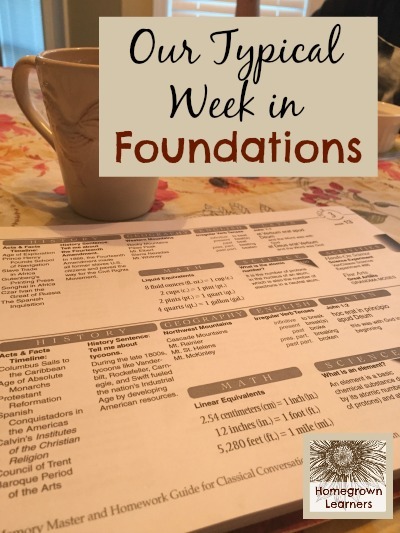 If you aren't familiar with Foundations, our kids memorize facts each week -- 6 facts to be exact -- in the areas of Math, History, Latin, English Grammar, Science, and Timeline. Our children also receive Fine Arts (artists, musicians, playing the tin whistle) instruction that we can expand upon during the week. This works well for our family, and I appreciate how well integrated the memory facts are, and how everything eventually ties together in the Challenge years. We take each breakfast time to review the memory work - drilling the facts 3-4 times while we eat. I simply drill from our Foundations guide. There is NOTHING fancy about that. Sometimes I also will review previous weeks' memory work by using a simple dice game I created. During the day my son will also use the Cycle 3 app to review previous weeks of memory work. We also play the Memory Work CDs in the car. While some people believe that rote memorization of facts is pointless, I believe quite the opposite. I am filling my son's toolbox with facts. Children LOVE collecting things, so why no collect facts? He draws upon theses facts so often, and will apply these facts as he grows and moves into the Dialectic stage of learning. Each week it's impossible for us to expand upon ALL areas of the memory work, and I don't think it's necessary, either. Remember, the memory work is enough! In fact, I believe that being in CC has freed us up to do MORE of what we enjoy, because I know that if I cover the memory work with my son he is getting a wonderful FOUNDATION. Each week (in a perfect world) we cover 2-3 areas in a little more depth. I will share about those with you today. Please don't think I just ignore the other areas of the memory work, but some weeks we simply don't expand upon those that aren't mentioned here. My son has an affinty for history, so we spend A LOT of time with history. Using our history notebook for Cycle 3, he notebooks his way through the history sentences. This week the history sentence was about American tycoons during the Industrial Age, so I've downloaded Industrial Age pages from Notebooking Pages and he researches and notebooks about a different tycoon each day. He always visits the Kingfisher History Encyclopedia first, and then does a general internet search. We also coordinate our read-alouds with the history sentences (see our Cycle 3 Reading List). I am also a huge fan of the PreScripts books, and he copies the history sentence and completes a simple art lesson each week. Geography simply involves reviewing the memory work by tracing the current map for the week. This week we are studying the Northwestern Mountains, so after a few days of tracing the US map and labeling the mountains, my son knows them easily. We created a Geography Table and keep all of our supplies for tracing there. Because I also want my 13 year old Challenge student to learn about the artists, we take one morning (after breakfast) each week to watch a YouTube video and read a book about the week's artist. Last week it was Grandma Moses. This week it was Norman Rockwell. I found a simple YouTube video with his paintings, and Grant read Getting to Know The World's Great Artists: Norman Rockwell. 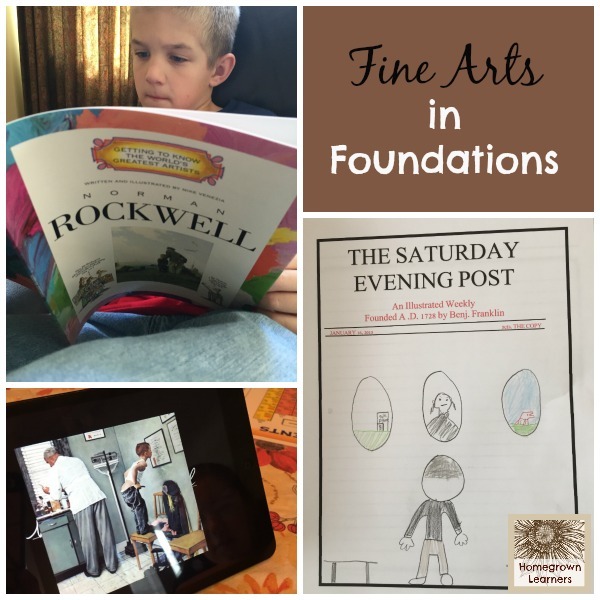 Using a printable I found on CC Connected, he created his own Saturday Evening Post cover - such a cute idea. As we move into the composers and eras of music later in this cycle, we will (OF COURSE!) 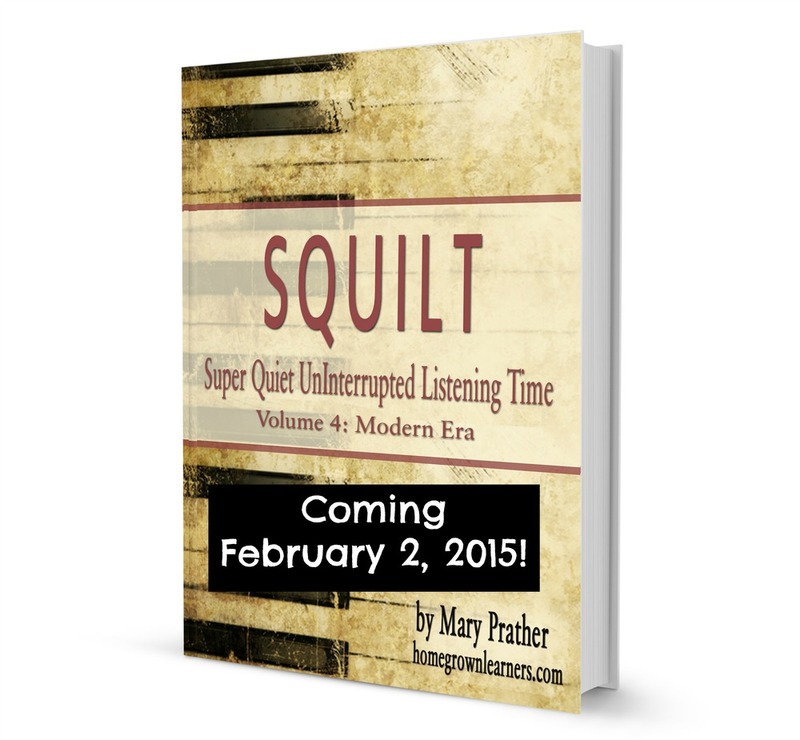 be using SQUILT music appreciation - Romantic & Modern Eras! *A side note - I just finished the Modern Era volume and it goes on sale MONDAY! Yay! Latin has been the best surprise for me! I was hesitant about Classical Conversations for one reason only: LATIN. What an unfounded hesitation that was! We are having a lot of fun learning John1 in Latin. Learning it in small chunks and playing a game make it great fun. My friend Pam has created a game - Race to the Colosseum. 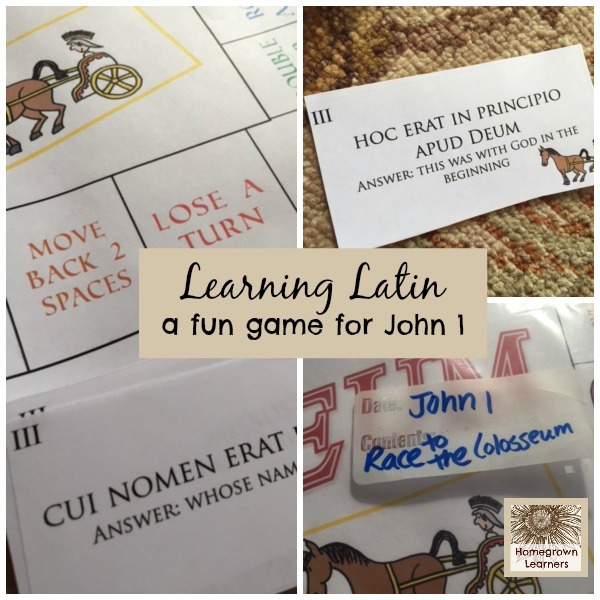 This game is easy to play and helps Grant and I review all of the Latin vocabulary and larger sentences in John1. I am ASTONISHED that Grant is memorizing all of John1 (in Latin!) effortlessly. Pam makes a lot of wonderful Latin materials that can help not only the CC mom, but homeschool moms in general. It's important to leave time for our children to pursue what interests them. 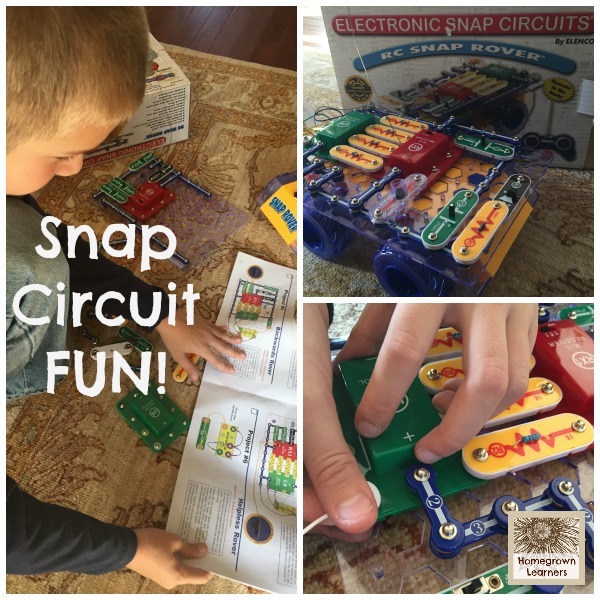 This week Grant was handed down a Snap Circuit RC Snap Rover. He has also been playing quite a bit with our LEGO® Education StoryStarter kit. We received some extension packs in the mail last week and I expect he will start writing stories with them in the coming weeks. Every single break this child had was spent outside playing basketball - even in 40 degree weather! He's OBSESSED with basketball right now, and the Atlanta Hawks are playing well just for him! Grant's days are quite magical, actually. He goes from CC work to basketball, to piano pratice, to Essentials work, to more basketball, to LEGOS, etc.... He's always busy and happy, and this makes ME happy. Last October many of you were saying prayers for my father and my husband's father, who were both in the hospital at the same time. Now my mom needs your prayers. Last year she battled breast cancer and is now cancer-free. She has been having debilitating back problems, however, that necessitate a serious surgery. I will be traveling to Florida soon to help my parents. My husband will be left home to hold down the fort (which he is GREAT at doing!). With my husband's travel schedule, keeping up with a music curriculum business, and just the other activities of life, I'm starting to feel a bit under the gun. Preparations are also underway for the Refresh Retreat in Birmingham, AL - where I will be speaking! Thankfully, I am feeling equipped to handle whatever comes our way. I'm losing weight, exercising, and feeling so much better. I find that God is equipping me for the journey, so I really shouldn't worry or fear.